Robin Holloway writes in his notes for this record that 'It seems both odd and foolish to take one of the acknowledged pinnacles of western music and 'recompose' it'. 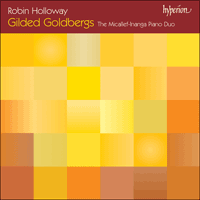 But his 'Goldberg adventure' (as he calls it) began with modest aims as a didactic piece. Frustrated as a single pianist by inability to clarify the close-weave canons or manage the more fiendish hand-crossing so idiomatic on a twomanual harpsichord, he began to transcribe a few for two pianos. Over the next few years he became absorbed with the task and ended up with another 30 completely new 'Goldberg' variations which have delighted and entertained audiences who've been lucky enough to hear the work. Here it is played by the exciting Micallef-Inanga Piano Duo who have made a speciality of the piece. Since it plays for 120 minutes two discs are needed to accommodate it, so here they are for the price of one. It seems both odd and foolish to take one of the acknowledged pinnacles of western music and ‘recompose’ it. My excuses are, first, that Bach was himself an eager transcriber and transformer of other men’s music from which he could learn; and, second, that his own has been so very adaptation-friendly down the ages. There’s scarcely a subsequent composer who hasn’t imitated, arranged, orchestrated, parodied, or paid homage in one way or another. From Mozart’s string transcriptions of fugues from the ‘48’ (and the very different influence of this great collection in Beethoven, Mendelssohn, Wagner, Bruckner), Schumann’s accompaniments to the solo violin partitas, Liszt’s piano versions of famous organ works, Brahms’s piano left-hand transcription of the solo violin Chaconne (not to mention the original works of all three where Bach looms large); to the orchestrations by Schönberg, Webern, Elgar, Respighi, Stravinsky, and on to the St Bach Passion of Kagel: the succession is endless and fascinating. Sometimes the original acts as springboard for new forms and materials; sometimes, as in Kurtág’s piano-duet arrangements, the spirit is humble and obedient. My own Goldberg adventure, in upshot huge and deliberated, actually began with comparably modest aims. Frustrated as a single pianist by inability to clarify the close-weave canons or manage the more fiendish hand-crossing numbers so idiomatic on a two-manual harpsichord, I began to transcribe a few for the domestic medium of two pianos – for instance the canon at the unison (variation 3) where the voices are inextricably entangled in the same range of the right hand, or the athletic variation 20 where the left hand knoweth not what the right hand doeth. Unless you’re Glenn Gould, Angela Hewitt, András Schiff, Murray Perahia, such things are well nigh impossible to make successful sense of on one keyboard. The only licence here was the occasional octave-doubling (for the sound) and redistribution of the parts at repeats (for the players’ interest). These first attempts sounded OK and yielded such pleasure in performance that I felt encouraged to try more. If I’d realized at this stage that Josef Rheinberger had published the entire work, arranged for two pianos, in 1883 – in order, as he said, that this masterpiece ‘more studied than played’ should be available as Hausmusik for all music-lovers – I’d surely not even have begun! My first awareness of this predecessor came about when my own project was already quite far advanced in all its brazen infidelity. I’d begun, May 21 1992, with a straight transcription of the first canon; but the very next day the venture already began to deviate – transforming variation 28 from virtuoso harpsichordish buzzing into an almost impressionistic haze of pianistic trills and tremolandi. May 23/24 produced variation 20, again a virtually exact transcription till the burst of Scarlatti-clashing towards the end. So even in a place where arrangement was the only goal, ‘interference’ crackled the transmission. Or ‘Stravinskification’ – for whatever the mot juste might be, what had begun in functional obedience turned almost at once towards ‘re-composition’ and eventually drew miles away from the first modest aim, to grow into something more ambitious than I could possibly have imagined. In ‘phase 1’ the changes were mainly simple and close to the original, consisting in different ways of shifting the emphases, by games of proportion, mode, tonal perspective. Thus the next effort (May 25) – variation 21, canon at the 7th, exchanges the canonic voices at repeats, producing different intervallic relationships. At the end of that month came variation 11, again (as with variation 28) changing its character, from brilliant to dreamy, in a homage to Brahms which interweaves also a strain from a favourite Schubert work (the A major Rondo, by which I first discovered as a lad the joys of piano-duetting). June 28/29 produced variation 8, the first in which, by composing-out repeats and adding extra bits, the length of Bach’s original is expanded; and on the 29th I also completed the canon at the 3rd (variation 9) after an earlier failure to capture this Grainger-ish sound in a Grainger-ish texture of two pianos, six hands. At the end of that month came the first of several parodies – variation 10, where surely Bach has his tongue somewhat in his cheek. This fugato pomposo becomes in turn a parody of a particular kind of twentieth-century ‘wrong note’ Baroque-revival. The venture was swelling. Still in the same year (1992) July 7 produced the aria itself – almost back to straight transcription, but opened out to make a dialogue between the two players, suggestive of the mutual suspicious and eventual gracious accord between an archaic clavichord and a modern grand; July 8/9, variation 1, wherein the game of changing the repeat points sets firmly in; 9/10, variation 2 – simple tonal ‘cubism’ whereby the key relationships are all juggled though the content and flow of the original are virtually unaltered; July 15, the canon at the octave (variation 24) wherein a minore version follows the major, and the resulting mix of modes is put through a rainbow of keys as upbeat to the ultra-chromatic G minor of variation 25 (July 17-25), in which the original’s wonderful endless ornamented cantilena was cut into sections whose order was then scrambled in a play of chance, the endeavour being to make complete sense – grammatical, rhetorical, directional, expressive – of the resulting new contour, without any transposition of pitches. If this sounds both hubristic and sacrilegious, that’s exactly how it seemed to me at the time, for a long time after, and sometimes still. To be so free with the celebrated ‘black pearl’, emotional centre of Bach’s second half and indeed of his whole scheme! (Moreover there was by now scarcely a trace of the original ‘excuse’, to transcribe pieces awkward or near-impossible on a single keyboard.) Despite doing what I was doing with evident brio I felt extremely tentative, diffident, ashamed. Never having mastered academic harmony-and-counterpoint I felt technically vulnerable; aesthetically I felt dubious; and morally wobbly. Fortunately the domestic circumstances – two pianos always at the ready in my rooms at Cambridge, plenty of friends, colleagues, pupils around to try things out the moment they were sketched – helped assuage such angst. These people were not diffident or ashamed! On the contrary they expressed pleasure and delight as we tried out each successive effort from my roughly scribbled pencil drafts. I was eager for improvements, all the way from practicalities of the two-piano layout to correction of solecisms in style, grammar, and taste. Moreover, though the principal goal was always such domestic music-making à deux, people seemed to like listening to them too. From this two-way enjoyment came the idea of dedicating particular numbers to friends who’d helped, or who relished, or both. Which led naturally to the notion of portraits as in the ‘Enigma’ Variations; and also, where appropriate, tributes to the dedicatee’s particular manner of playing. It was entirely because of such encouragements that I’d got so far, and felt emboldened to go on, with this funny project whereby an ignorant autodidact confronts one of the most comprehensive lexicons of didactic music-making ever conceived. The only possible response to justified criticism was to try to intensify to their full nature the odd things that were happening, rather than try to curb them into correction (and anyway, as I later found, Rheinberger had already done his ‘correct’ version). Go for the gilding and lose the guilt! The remaining numbers done in 1992 were less drastic than variation 25. On July 19 came variation 4 (another kaleidoscope of modulations over the otherwise unchanged original); on 20-22 variation 26, the Sarabande, split in two to contain the canon at the 7th (variation 27) and closing with a Rückblick in tribute to Schumann; on August 4/5 the Quodlibet (variation 30), traversing the entire structure three times, moving through all twelve keys, carefully aiming for a resounding close in D to make a huge cadence into the return of the Aria in the work’s fundamental G major (August 6), opening out into a brief extra canon as on a sweet-toned old music-box, before the ‘Farewell Symphony’ ending. On September 5/6 came variation 5, a whirlwind tribute to Scarlatti; on 7-9 the canon at the 2nd (variation 6) with its answering phrases of canonic infill then a ‘ghost’-reply of the whole in a surprising new key; and the ensuing gigue (variation 7), wherein the two pianos answer each other antiphonally in the cross-keys (Bach’s original not altered at all save for the necessary transpositions), to meet again in the re-affirmed G major of the already-existent number 8. All this completed ‘phase 1’ – twenty-one numbers, from all over the original, launching a project quite different from what was first envisioned: one that had to be continued and if possible concluded. Over the next few years the obligations to what was going on became more definite. Above all, the need for an overall balance – larger-scale contrasts and complements, to make the trajectory and proportions of the entire journey. Already I’d decided to transpose freely. Bach’s original is entirely in G major with a few in G minor. In ‘phase 1’ my key-shifts were local; now I needed to plan the wider relationships – involving, inevitably, the fair representation of every key – quite a Bachian ideal, of course! (But only when the whole thing was done did I realize that, though several numbers reached an emphatic dominant there was no variation actually in D: so after the first private complete performance – in my own residence with as many as possible of the original dedicatees participating – I recast variation 20, one of the earliest, and at first straightest, to rectify this). Also around now I grouped the variations into ‘chapters’, as in a book, subdividing Bach’s broad two symmetrical parts (with a clear new start half way at the Ouverture) into five – three in the first half, two longer ones in the eventually more-elaborated second. Also I had much else to write every summer, to commission rather than this labour of love: to try two or three new ‘Gildbergs’ was a way of charging up the flat batteries and scraping off the rust before settling down to the next large-scale task. So there was never again the same spate as at the start. It became harder to think of new approaches: and moreover some of the most daunting numbers had to be faced and ‘overcome’. This is the longest piece in the whole venture. The next-longest was the only number written the next year (summer 1995): the Ouverture that stands like a dragon guarding the entry into the second half. Privately, Bach’s variation 26 had always seemed to me a dull, formulaic affair – the galumphing slow section all empty show, the poor little runt of allegro that follows dwarfed by what precedes, to abruptly end in a ridiculous bar of one chord only, trying but failing to restore the slow grandiose start. I wanted a real fire-breathing dragon, not a perruqued harpsichordist in a pique: G sharp minor, not the same old G major: the slow section charged up with crashing/grinding dissonance: the fast section more than quadrupled in length, complexity, light and shade, fun and games culminating in cascades of notes (ultimately glissandi) evoking the astonishing player-piano studies of Conlon Nancarrow, before a consummatory return to the slow music instead of a feeble token gesture. But my grand flourish remained a token gesture too, for something like two years. The last bastion of unanswered variations (seven in all, variations 17 to 23, but excluding 20 which in its original all-G version had been amongst the first; and 21, canon at the 7th, which also was done very early) gave enormous trouble, sometimes for its intrinsic difficulty, eventually just because it was so difficult to think of any new angle or trick! They were all solved in the summer and autumn of 1997. First came variation 19, in which Bach’s unmistakable Ländler seems possibly to solicit what certainly happens to it, a collage of quotations presenting a mini-history of subsequent Austro-German music in 3/4 time (Haydn to Hindemith) shaped as a minuet with trio. The only original bars in this 209-bar movement are the eight making the link into the middle section. Yet, inexplicably, the edges blur; it sounds like a unity, and a genuine structure upon the Goldberg groundplan (though it is in actual fact neither). Next came, late July, variation 17, in which the steady patterns of Bach’s two hands are taken separately, not simultaneous, as background to florid gipsy-style flourishes and cymbalom-tremolandi (homage to Bartók, Ligeti, and Kurtág); to issue in a doïna or impassioned folk-lament (homage to Enescu), calming down into the canon in sixths, variation 18. This was by far the hardest number for me, though playing it now it’s difficult to remember. It seems so pellucid – to take the salient interval and then multiply it vertically to the edges of what’s playable on two keyboards, constructing an asymmetric mirror-world of piled-up sixths, curved in upon itself like layers of time moving simultaneously. (Perhaps not so simple after all!) It took from late July to late September (on and off) to get this speculative vision into focus. After it the hearty Ländler and the athletic toccata already mentioned (19 and 20) provide physical relief. Only two were left, and by now I really felt I’d painted myself into a corner. Duty rather than pleasure did service here (though I trust this doesn’t show). Variation 22 (September 29/30) is another parody where I’m sure Bach wore his surplice with an ironic smirk – for it is a choral motet in a consciously ‘churchy’ style. Finally (October 1/2) variation 23 whose original combines pealing bells, chopping movements between the hands and their separate manuals, and crossover work for the arms that Tovey frankly called humorous, obstinate, absurd – Bach the Grotesque. My recourse was to heighten all these characteristics, transforming the bells from pastoral noodlings at the start (a homage to Tippett), thence to a peal of eight-part church polyphony as elevated as variation 22 had been sarcastic; exaggerating the grotesquerie in the middle section; and building the chopping movements, now displaced between the two players, into a sonorous unanimous close – to chapter IV of the overall shape, to my adventure as a whole with Bach’s wonderful work. Perhaps what this adventure most resembles is the enchanting Humument of Tom Phillips. Like him with his lovingly decorated, desecrated, encyclopaedically-enveloping treatment of a Victorian novel, I believe I might go on annotating my original for ever. (Clearly the next step would be to intercut all thirty different textures …) But there is one vital difference. Tom Phillips’s source is, by choice, a duff dead duck, whereas the ‘Goldberg’ Variations is one of the supreme monuments by the greatest of all musical constructors. Like a Forth Bridge, like a mighty power station, Bach’s structure is so secure that it can take anything. Or rather, because less subject to change and decay, he resembles a mighty force of nature itself. Yet the actual stuff of his music is infinitely malleable, reproductive, fertile in new growth, perpetually inviting renewed collaboration down the ages.